(PRLEAP.COM) – Lane Mendelsohn, President of Vantagepoint ai, the company behind the world's first artificial intelligence (AI) trading software available to the retail investor and traders, was invited to do a live interview with Yahoo! Finance. Wednesday morning, Lane Mendelsohn, artificial intelligence trading guru and President of Vantagepoint ai was interviewed live on Yahoo! Finance. 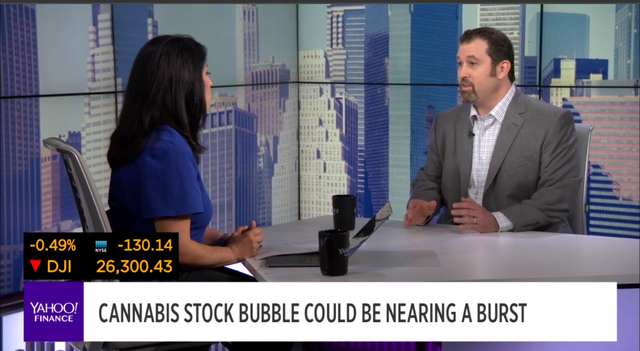 The purpose of the interview was to get Lane's expert insight on the cannabis stock sector and what his software is predicting in the days ahead. With the legalization of cannabis, many traders and investors are keeping a close eye on the cannabis sector and it has been on a rapid rise. However, there has been some concern that the current bubble could be nearing a burst which is why they needed an expert opinion on the topic. They brought on Mendelsohn because of his patented, artificial intelligence software that looks at stock market trend data and can foresee and predict when changes in direction are going to happen. In fact, it can forecast market trend direction up to 3 days in advance with up to 86% accuracy. "It is important now, more than ever, with changes in regulations, to be very selective about which companies and which stocks people are choosing to invest in and trade." said Mendelsohn. VantagePoint uses a one of a kind method of pattern recognition that analyzes the impact other markets have on a specific market, called intermarket analysis which is not humanly possible to do without the use of this proprietary technology. That is why nearly 30,000 traders and investors have turned to VantagePoint.